It is difficult to differentiate the characteristic features/behavior of secondary cancer from the primary. Moreover, stages/steps involved in the carcinogenesis are similar for both first and secondary tumor. It is a well-established fact that radiation either alone or in combination with chemicals is a preferred choice of cancer treatment, that is, the therapeutic agents kill the cells by different mechanisms or prevent cell division machinery. It is unfortunate that, while doing so, it cannot discriminate the tumor cells from normal cells. An inherent property of all live cells, irrespective of its nature (tumor or normal), upon a DNA damage or threat, responds to the situation and sends signals to the surrounding neighbors. In turn, recipient cells could respond to the signal received from irradiated cells either immediately (bystander response) or in their progeny (genomic instability) collectively termed as non-DNA-targeted effects of therapeutic agent. Since there is no difference on the phenotype of primary cancer from that of secondary cancer, it is difficult to identify the etiology. Nonetheless, we have hypothesized that bystander effects and/or genomic instability are possible causes for secondary malignancy; this is because the first lines of cancer therapeutic agents are known for its property of destabilizing the genome. The review focuses on the possible contribution of those phenomena and mechanisms involved in the developments in therapy-induced secondary cancer; it is the authors' perspective based on their experimental evidence generated in their laboratories employing in vitro cell culture models that closely mimic in vivo tissue microenvironment. To move from quiescent (dormant) stage to an active proliferative stage, normal cells require growth-promoting signals; whereas, in cancer cells, they can secret their own mitogenic signals (oncogenes mimic the normal growth signal) and are independent on the normal tissue microenvironment for growth stimulations. Inhibitors and antiproliferative signals help maintain normal function and tissue homeostasis. Tumor cells use various strategies to avoid and bypass these signals and proliferate infinitely. During tumor progression, cancer cells can invade into distance tissues with the help of altered protein expression (E-cadherin), as well as enzymes (metalloproteinases) which degrade the extracellular matrix proteins. Tumor cells overcome their property of senescence by protecting and maintaining the telomere length of chromosomes by upregulating the expression of telomerase activity, thus acquiring unlimited replicative potential. Sufficient oxygen and nutrients are essential for constant cell function and survival, which is supplied by vasculature. 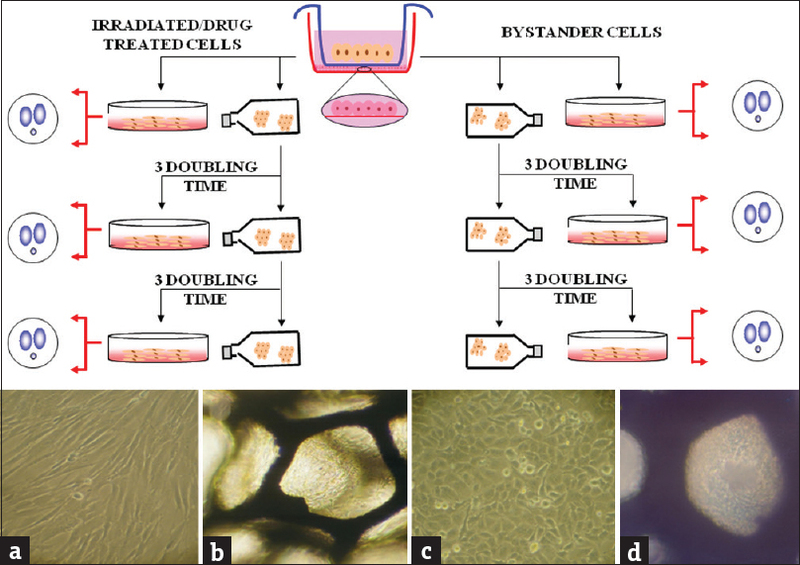 Continuous growth of tumor cells and sustained demand of those critical requirements is met by the turned on position of “angiogenic switch” with the help of countervailing factors such as vascular endothelial growth factor. Tumor cell populations to expand in number, the rate of cell attrition should maintain along with the rate of cell proliferation. Apoptosis represents a major source of cell attrition; cancer cells acquire resistance to these components through both extrinsic and intrinsic strategies. In addition to those well-established features of cancerous cells, emerging hallmarks such as deregulating cellular energetics, avoiding immune destruction, tumor-promoting inflammation, and genome instability have been reported. Induction of genome instability measuring of damages followed by cell death is a well-established sequential event in killing a cancer cell upon exposure to therapeutic agents. The cell death execution mechanisms are enormous; it depends on the action of the therapeutic agents. Most commonly adopted modality is the use of radiation and chemicals. They are considered as double-edged sward, that is, they can kill a tumor cell as well as transform a normal cell into a tumor cell; dose/dosage used discriminates the effect. Our focus in this review is to provide an insight on the possible late consequences (secondary malignancy) of those agents which are primarily used for the eradication of tumor cells. However, it is also known for its property of inducing genome instability in nontargeted cells. Cancer development is understood as a multistep process, and the well-established phases are initiation, promotion, and progression [Figure 1]. Initiation is considered as the first step in carcinogenesis, and during this process, one or more stable cellular changes result in exposure to a carcinogen in a targeted cell. In turn, those changes induce survival advantage to the affected cell and its progeny to subsequent neoplastic transformation. Successive accumulation of mutations and chromosomal alterations as well as microenvironment support the transformed cell grows into malignant, and the process of increasing malignant subpopulations is known as progression. Upon increase in size, the cells lose their adherence property and detach from the tumor site and invade into neighboring tissues through circulating blood, lymph and develop into secondary tumors at new sites. Studies have shown that radiation is a universal carcinogen, because it has the ability to induce cancer in all tissues, species, and ages including fetus.,, Unlike to that of other carcinogenic agents which are tissue specific in their action, the ionizing radiation has the potential to travel and deposits energy within them without any cellular barrier. When radiation passes through the cells, it can ionize the atoms that comprise basic DNA material and leads to formation of single- and double-strand breaks. Even though different repairs [Figure 2] and cell cycle mechanism assist the cells to repair those damages, cells can fail to repair and start to accumulate the damage. In turn, an accumulated DNA damage leads to genomic instability like translocation or deletion of potential tumor suppressor gene or activation of oncogenes., This finally leads to the initiation of carcinogenesis as detailed previously. A secondary malignancy is a new cancer that is unrelated to the primary, developed in an individual as a result of previous treatment. Secondary malignancies, after radiotherapy or combined radio and chemotherapy, are seen to be more frequent in younger individuals compared to adults. This increased risk of secondary cancer may in part reflect the induction of genome destabilizing mutations during the treatment although the potential mechanism remains speculative. Radiation-induced secondary malignancies occurring followed by treatments for the primary tumor have become an increased concern; however, their incidence has long been underestimated as majority patients had a short life expectancy after treatment or their follow-up was shorter. Nonetheless, improvements resulting in long-term survival, follow-up for longer duration, and elegant cancer registries revealed that 18%–20% of the cumulative incidence of secondary malignancy was observed in patients treated by radiotherapy and combined chemo and radiation for solid tumors. Among the treated patients, a higher incidence of secondary malignancies has been recorded in women subjected to radiation therapy. Another worrisome observation was that the risk of patients receiving treatment at younger age (<21 years) was even greater (14-fold high) for death from a secondary cancer. Despite the fact that intensity-modulated radiation therapy (IMRT) allows dose to be concentrated in the tumor volume while sparing normal tissues, treatment of children with IMRT became a serious issue because children are more sensitive, higher dose to the exposed region due small body, childhood germline mutation. Similar to that of solid tumor, children with acute lymphoblastic leukemia underwent primary therapy showed to have 20% excess risk of developing secondary malignancy. Overall results imply that a local recurrence after curative radiotherapy arises from a single or a few tumor stem cells which have not been killed and retained their infinite proliferative capacity. Available evidence support the view that the nontargeted effects of therapeutic agents such as chemicals and radiation may contribute the risk for the development of secondary malignancies followed by treatment irrespective of tumor type. The well-accepted fact that biological effects of ionizing radiation are mediated through direct energy deposition on the bio-molecules in particular the DNA, followed by damages occurring in exposed cells, was challenged by the study of Nagasawa and Little; that in addition to these direct DNA damage-dependent effects, irradiated cells also send signals to their neighbors, and in turn, these neighboring recipient cells respond to signals produced by irradiated cells, which has been termed as the bystander effect. An extensive review of Blyth and Sykes summarized the different definitions on the phenomena and grouped the published effects as (i) bystander effects (communication between irradiated cells and nearby unirradiated cells within the irradiated volume), (ii) abscopal effect (communication between irradiated tissues and unirradiated tissues outside of the irradiated volume), and (iii) cohort effects (occur between irradiated cells within an irradiated volume). Manifestation of the bystander effect has been observed in response to ultraviolet radiation, photodynamic therapy, heat, and chemotherapeutic agents. Bystander responses have been observed in most cell types, such as peripheral blood lymphocytes (PBL), skin fibroblasts, human endothelial cells, and a variety of tumor cells, for damage-mediated end points such as DNA damage, mutations, and transformation. A variable and cell line dependency on the induction of bystander effect was first reported by Mothersill and Seymour. Mancuso et al. have shown that Ptch1 (the sonic hedgehog receptor) mutant mice develop bystander-related tumor at cerebellum after X-ray exposure to the remaining parts of the body while the head was protected with lead shield. Brain tissues are more radioresistant compared to other type of cells in human body and require higher doses to manage efficiently than other type of tumors; it is important to note that even those cells showed bystander response followed by exposure to 3 Gy of X-radiation. Similar to radiation, chemotherapeutic agents also have shown to induce bystander effects. Chemotherapeutic drugs such as mitomycin, phleomycin, actinomycin, and chloroethylnitrosourea  induce bystander response in normal human B-lymphoblastoid cells; bleomycin (BLM) and neocarzinostatin (NCS) induced bystander response  in unexposed neighboring cells similar to ionizing radiations. Short dose of Cr (VI) can induce bystander response in stem cells, cancer cells, and fibroblasts. Chemotherapy has become one of the most effective treatment options for cancer. New drugs that have the ability to kill cancer cells are coming out of the market in a fast phase. Interestingly, most of the successful chemotherapeutic agents work by inducing DNA damage in cancer cells and also surrounding cells owing to bystander effects; if one agrees the view, then the phenomena make them as potential stimulator for secondary malignancy. 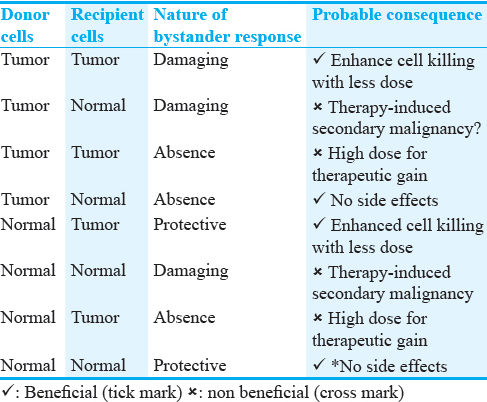 Identifying chemotherapeutic agents that can minimize the effect of bystander response will be a good option to reduce the probability of chemotherapy-induced secondary cancer. While we discussed mostly about the detrimental effects of bystander response in the previous section, they are also a positive side for it. Scrutiny of literature shows that while many end points studied for bystander effects are detrimental to the unexposed cells, certain beneficial bystander responses such as accelerated cell proliferation, DNA repair, terminal differentiation, and apoptosis  have also been reported in bystander cells. Neoplastic human salivary gland was irradiated with carbon ion and cocultured with unirradiated cells; the bystander cells showed an increased proliferation dependent on the dose rate and linear energy transfer (LET). Enhanced growth of unlabeled rat liver epithelial cells was observed when cocultured with cells that are radiolabeled with tritiated thymidine. Similarly, when normal human diploid lung fibroblasts were grown in mylar dish and irradiated with α-particle, a decreased expression of p53, CDKNIA, and MDM2 was observed in bystander cells correlated with an increased bystander cell growth. Further, an increase in proliferating cell nuclear antigens and cell division cycle protein 2 (CDC2) was also observed in bystander cells. The accelerated differentiation was also observed in a multicellular tissue from porcine epithelial cells of ureter; about 10%–15% of additionally differentiated cells within the explant outgrowth were observed followed by highly localized irradiation to only a few cells within the epithelial layer. The premature differentiation was suggested as a survival strategy to maintain the genetic stability of the system. That repair processes could have involved beneficial bystander effects through the release of growth factors, such as cytokines, and the initiation of cell-signaling cascades resulted in tissue restoration. Despite the demonstration of bystander response in different cell types exposed to various DNA damaging agents, bystander effect was not a universal phenomenon.,, Bystander response was documented to be radiation type dependent. For example, bystander response was observed in medium transfer experiments, after exposure to only α radiation and not to gamma radiation, implying that radiation-induced bystander effects depend on the nature of radiation. Mothersill and Seymour have demonstrated that the radiation-induced bystander effects and response are highly variable and dependent on the cell lines tested. Failed to observe bystander response in cells that lack altered sources of energy implies that bystander effect is an energy-dependent process. Moreover, molecules involved in signaling pathways such as DNA-PKcs, nonhomologous end joining repair, and ataxia telangiectasia mutated were shown essential to generate to manifest bystander effects., The expression of bystander response also depends on the endpoints; neither human colon cancer cells  nor normal cells showed evidence of radiation-induced BE with clonogenic assay. 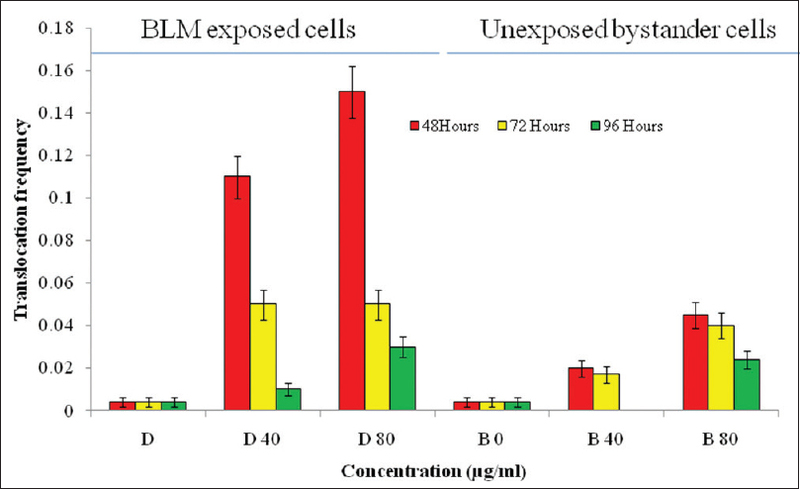 Similar to radiation, we have reported negative bystander effects for BLM; human glioblastoma cells exposed to BLM and cocultured with unexposed cells. There was no genotoxicity or cytotoxicity in bystander glioblastoma cells, an evidence of absence bystander effects. At the same time, we exposed glioblastoma cells to BLM and cocultured with lung cancer cells and vice versa. Our results showed an interesting observation that glioblastoma cell did not secrete but can respond to bystander signaling. Reported negative bystander cell response in glioblastoma cells suggest the existence of heterogeneity in the bystander response; it might be due to synergistic/antagonistic interactions of more than one signaling pathway and many signaling molecules or vice versa. Thus, a scrutiny of literature clearly demonstrated that irradiated cells/tissue can interact with its unexposed cells either close or distant neighbors. However, the response of the responders are quite variable; it depends on exposure dose, dose rate, radiation quality, exposed tissue type, exposed tissue volume and dose distribution, effective signaling range, the potency of the signals, and the time scale over which they operate. Consistent with the published reports, we have reported that both chemotherapy drugs and X-irradiation could induce bystander response in both tumor and normal cells. Normal human lung fibroblasts (WI-38), human bone marrow mesenchymal stem cells (hBMSCs), lung adenocarcinoma cells (A-549, NCI-H23), and PBL were exposed to chemotherapeutic BLM and NCS and X-irradiation; those cells exposed and then cocultured with unexposed cells, the unexposed recipients showed a significantly excess DNA damage measured as micronuclei formation. Further, the X-irradiation and BLM-induced bystander response measured using micronucleus (MN) assay is more pronounced in PBL and hBMSC (attributed to the presence of plasma factors and undifferentiated phenotypes respectively), while the hBMSCs are more sensitive to NCS than PBL. In contrast to tumor cells (A-549, NCI-H23) derived from lung tissue, the Brain Malignant Glioblastoma 1 (BMG-1) failed to show a bystander response. That is when BMG-1 cells responded to the bystander signals released by BLM-exposed A549, NCI-H23, SiHa, and PBL while the BLM-exposed BMG-1 cells did not induce bystander effect in the A549 and NCI-H23. Overall results of our observation from in vitro exposure to chemotherapeutic drugs differ from that of in vivo study exposed to radiation reported by  Mancuso et al., where Ptch1 mutant mice develop bystander-related tumor at cerebellum after X-ray exposure to the remaining parts of the body while the head was protected with lead shield. In view of the observed heterogeneity in the bystander response, at present, it is not clear how the studies of cells in culture relate to chemical responses in tissues. Nevertheless, a possible outcome of this effect toward the occurrence of secondary malignancies as a result of radiotherapy and chemotherapy may not be ruled out completely. It is because targeted tumor cells could elicit a bystander response in the surrounding normal cell which in turn has the higher probability to make the stable genome into unstable similar to the event involved in carcinogenesis. In alternate with a reduced dose, a better therapeutic gain can be obtained provided tumor cells could induce the cell killing in the surrounding neighbors. Thus, the outcome of bystander response depends on the type of effects (protective/destructive or positive/negative) [Table 1]. An increase in genomic alterations such as chromosome rearrangements, MN, aneuploidy, delayed mutagenesis, gene amplification, and cell death in the progeny of irradiated cell is known as radiation-induced genomic instability (RIGI)., Lorimore et al., 2005, have shown that the transmission of RIGI in fetal hematopoietic cells could predispose the animals to develop the hematological disorders and malignancies. Watson et al. have demonstrated that in vitro-induced instability can be transmitted to in vivo using animal experiments. In addition to animal experiments, humans occupationally exposed to γ-radiation and/or α-radiation to a wide range of accumulated doses owing to prolonged exposures showed changes in the DNA and mitochondria in delayed times after exposure. It was also significant to note that persistence of bystander factors in chernobyl liquidator blood samples for more than 20 years as such long-term stability can contribute to the late effects. The genomic instability was carried out in progeny of cells directly exposed to both in vivo and in vitro to ionizing radiation.,, Continuous persistence of instability signature (frequency of MN) in bystander human fibroblast cells cocultured with tritium labeled cells, even after 9 population doublings. Similarly, Ponnaiya et al. showed the persistence of chromosomal damage in BJ1 HERT bystander cells exposed to alpha radiation, even after 25 doublings, indicating the existence of genomic instability even in nontargeted cells. Available publications demonstrated ample evidence that ionizing radiation is independent of dose and LET and capable of inducing genomic instability in directly exposed cells. Limoli et al. have reported that a chemical such as BLM-induced genomic instability is also dose independent. Unlike where the genomic instability was investigated in the progeny of the exposed cells, we have investigated genomic instability and the existence of such phenomena in bystander cells.,, Our in vitro studies showed that growth architecture influences the magnitude of bystander response (MN formation, expression levels of p53 and p21) and its persistence in tumor cells (A549 and NCI-H23) induced by X-irradiation and BLM. Similar to that of unstable aberrations (MN), persistence of stable aberrations (translocations) in PBL cocultured with BLM-treated A549 cells grown in three-dimensional (3D) culture was observed. That the persistence of stable translocations in the PBL cocultured with BLM-exposed tumor cells [Figure 3] remains a serious concern on the long-term effects of cancer therapy, as this translocation might be an initiating event in inducing genomic instability a cause of tumorigenesis. Our initial study results in normal cells  are reconfirmed the phenomena (genomic instability) in the bystander cells [Figure 4] in experimental model (3D cell culture) closely similar to in vivo milieu condition. Based on our results, we strongly feel that similar effects, if it can occur under in vivo human exposure during treatment with primary cancer, can have higher probability to induce secondary malignancy. Studies have shown that radiation-induced bystander effects are mediated through transmission of either molecules or molecular signals. Either intercellular communication through gap junctions  or by release of soluble factors from the irradiated cells into the culture medium  are being proposed as mechanism involved in mediating the bystander response as well as genomic instability. Earlier, we have summarized molecules postulated to be mediating the response: Reactive oxygen species (ROS), interleukin 8, transforming growth factor β, tumor necrosis factor α, tumor necrosis factor-related apoptosis inducing ligand, 5-hydroxytryptamine, L-DOPA, glycine, nicotine, and nitric oxide have been implicated in radiation-induced bystander effects. Similar molecules and signaling molecules and pathways have been implicated in mediating the BLM-, FOLOX-, and PHL-mediated bystander response. Similarly, signaling pathways of cyclooxygenase-2 (COX-2), nuclear factor kappa B, and mitogen-activated protein kinase  have been shown to be involved in mediating bystander response. It is also showed that the activation of p38 results in activation of COX-2 bystander cells; thus, there are common molecules (predominantly ROS) and signaling pathways involved in mediating the bystander effect, genomic instability and inflammation as well as carcinogenesis. We speculate that the bystander effect and genomic instability could either reduce radiation damage and potential carcinogenicity of normal tissues (by reducing bystander signaling) or maximize cell sterilization during radiotherapy (by amplifying bystander responses in tumors), and vice versa. If the latter is dominant, it could have a significant contribution for late consequence (the secondary malignancy). Sufficient evidence has been documented that both radiation and chemicals used in cancer therapy can induce bystander effects and/or genomic instability. Recent evidence supports the fact that nontargeted effects of radiation or chemotherapeutic agents are as important as the targeted effects. Nevertheless, the manifestations of those phenomena are not universal. More in vivo data on the radiation and chemical induced bystander effects have to be carried out. Identifying the differences in bystander response based on the radiation type, radiation dose, cell type, and tissue type has to be done in detail. All the same, the existence of the phenomena are not denied completely under in vitro; the end points measured (chromosomal aberrations, mutations, changes in gene expression) among the studies are typical to that of manifested in directly exposed cells. 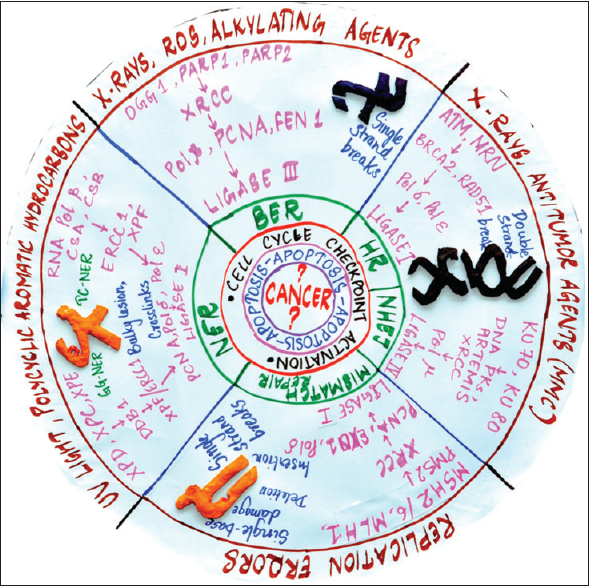 Moreover, molecular players and signaling pathways involved in mediating those responses are similar to those involved in carcinogenesis [Figure 5]. Keeping those views along with our own results, we believe that those phenomena could play a significant role in therapeutic agent-induced secondary malignancy. Identifying novel mechanisms that regulate bystander signaling and finding the right inhibitors will potentially reduce the risk of secondary malignancy. We would also like to thank postgraduate students from Human Genetics Department for their drawing on carcinogenesis and DNA repair. Financial assistance from the Atomic Energy Regulatory Board, India (AERB/CSRP/54/2013), Department of Science and Technology, Government of India (SR-SO/HS-127/2012). Evan GI, Vousden KH. 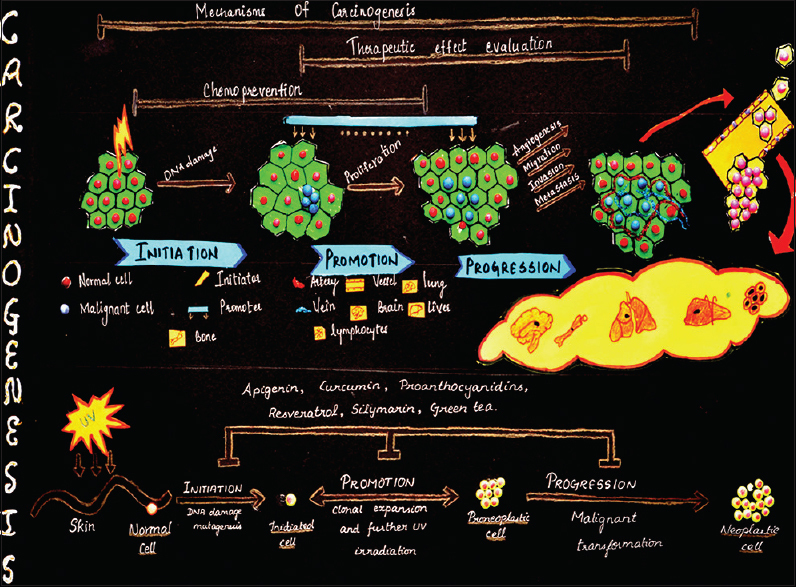 Proliferation, cell cycle and apoptosis in cancer. Nature 2001;411:342-8. Weinberg RA. How cancer arises. Sci Am 1996;275:62-70. Williams D. Radiation carcinogenesis: Lessons from Chernobyl. Oncogene 2008;27 Suppl 2:S9-18. El Ghissassi F, Baan R, Straif K, Grosse Y, Secretan B, Bouvard V, et al. A review of human carcinogens – Part D: Radiation. Lancet Oncol 2009;10:751-2. Preston DL, Kusumi S, Tomonaga M, Izumi S, Ron E, Kuramoto A, et al. Cancer incidence in atomic bomb survivors. Part III. Leukemia, lymphoma and multiple myeloma, 1950-1987. Radiat Res 1994;137 2 Suppl: S68-97. Little JB. Radiation carcinogenesis. Carcinogenesis 2000;21:397-404. Allan JM, Travis LB. Mechanisms of therapy-related carcinogenesis. Nat Rev Cancer 2005;5:943-55. Cohen RJ, Curtis RE, Inskip PD, Fraumeni JF Jr. The risk of developing second cancers among survivors of childhood soft tissue sarcoma. Cancer 2005;103:2391-6. Aleman BM, van den Belt-Dusebout AW, Klokman WJ, Van't Veer MB, Bartelink H, van Leeuwen FE. Long-term cause-specific mortality of patients treated for Hodgkin's disease. J Clin Oncol 2003;21:3431-9. Hall EJ, Hei TK. Genomic instability and bystander effects induced by high-LET radiation. Oncogene 2003;22:7034-42. Pui CH, Cheng C, Leung W, Rai SN, Rivera GK, Sandlund JT, et al. Extended follow-up of long-term survivors of childhood acute lymphoblastic leukemia. N Engl J Med 2003;349:640-9. Trott KR. Non-targeted radiation effects in radiotherapy – Roles of radiation-induced genomic instability and of the bystander effect in cancer cure by radiotherapy. Acta Oncol 2001;40:976-80. Nagasawa H, Little JB. Induction of sister chromatid exchanges by extremely low doses of alpha-particles. Cancer Res 1992;52:6394-6. Blyth BJ, Sykes PJ. Radiation-induced bystander effects: What are they, and how relevant are they to human radiation exposures? Radiat Res 2011;176:139-57. Bagdonas S, Dahle J, Kaalhus O, Moan J. Cooperative inactivation of cells in microcolonies treated with UVA radiation. Radiat Res 1999;152:174-9. Dahle J, Bagdonas S, Kaalhus O, Olsen G, Steen HB, Moan J. The bystander effect in photodynamic inactivation of cells. Biochim Biophys Acta 2000;1475:273-80. DeVeaux LC, Durtschi LS, Case JG, Wells DP. Bystander effects in unicellular organisms. Mutat Res 2006;597:78-86. Alexandre J, Hu Y, Lu W, Pelicano H, Huang P. Novel action of paclitaxel against cancer cells: Bystander effect mediated by reactive oxygen species. Cancer Res 2007;67:3512-7. Schmid E, Roos H. Influence of the bystander phenomenon on the chromosome aberration pattern in human lymphocytes induced by in vitro alpha-particle exposure. Radiat Environ Biophys 2009;48:181-7. Azzam EI, de Toledo SM, Little JB. Direct evidence for the participation of gap junction-mediated intercellular communication in the transmission of damage signals from alpha – Particle irradiated to nonirradiated cells. Proc Natl Acad Sci U S A 2001;98:473-8. Gaugler MH, Neunlist M, Bonnaud S, Aubert P, Benderitter M, Paris F. Intestinal epithelial cell dysfunction is mediated by an endothelial-specific radiation-induced bystander effect. Radiat Res 2007;167:185-93. Ponnaiya B, Jenkins-Baker G, Bigelow A, Marino S, Geard CR. Detection of chromosomal instability in alpha-irradiated and bystander human fibroblasts. Mutat Res 2004;568:41-8. Nagasawa H, Little JB. Unexpected sensitivity to the induction of mutations by very low doses of alpha-particle radiation: Evidence for a bystander effect. Radiat Res 1999;152:552-7. Sawant SG, Randers-Pehrson G, Geard CR, Brenner DJ, Hall EJ. The bystander effect in radiation oncogenesis: I. Transformation in C3H 10T1/2 cells in vitro can be initiated in the unirradiated neighbors of irradiated cells. Radiat Res 2001;155:397-401. Mothersill C, Seymour C. Medium from irradiated human epithelial cells but not human fibroblasts reduces the clonogenic survival of unirradiated cells. Int J Radiat Biol 1997;71:421-7. Mancuso M, Pasquali E, Leonardi S, Tanori M, Rebessi S, Di Majo V, et al. Oncogenic bystander radiation effects in patched heterozygous mouse cerebellum. Proc Natl Acad Sci U S A 2008;105:12445-50. Basheerudeen SA, Mani C, Kulkarni MA, Pillai K, Rajan A, Venkatachalam P. Human brain glioblastoma cells do not induce but do respond to the bleomycin-induced bystander response from lung adenocarcinoma cells. Mutat Res 2013;757:114-9. Asur RS, Thomas RA, Tucker JD. Chemical induction of the bystander effect in normal human lymphoblastoid cells. Mutat Res 2009;676:11-6. Jin C, Wu S, Lu X, Liu Q, Qi M, Lu S, et al. Induction of the bystander effect in Chinese hamster V79 cells by actinomycin D. Toxicol Lett 2011;202:178-85. Merle P, Morvan D, Caillaud D, Demidem A. Chemotherapy-induced bystander effect in response to several chloroethylnitrosoureas: An origin independent of DNA damage? Anticancer Res 2008;28:21-7. Chinnadurai M, Chidambaram S, Ganesan V, Baraneedharan U, Sundaram L, Paul SF, et al. Bleomycin, neocarzinostatin and ionising radiation-induced bystander effects in normal diploid human lung fibroblasts, bone marrow mesenchymal stem cells, lung adenocarcinoma cells and peripheral blood lymphocytes. Int J Radiat Biol 2011;87:673-82. Cogan N, Baird DM, Phillips R, Crompton LA, Caldwell MA, Rubio MA, et al. DNA damaging bystander signalling from stem cells, cancer cells and fibroblasts after Cr (VI) exposure and its dependence on telomerase. Mutat Res 2010;683:1-8. Belyakov OV, Folkard M, Mothersill C, Prise KM, Michael BD. Bystander-induced differentiation: A major response to targeted irradiation of a urothelial explant model. Mutat Res 2006;597:43-9. Grifalconi M, Celotti L, Mognato M. Bystander response in human lymphoblastoid TK6 cells. Mutat Res 2007;625:102-11. Shao C, Aoki M, Furusawa Y. Bystander effect on cell growth stimulation in neoplastic HSGc cells induced by heavy-ion irradiation. Radiat Environ Biophys 2003;42:183-7. Gerashchenko BI, Howell RW. Cell proximity is a prerequisite for the proliferative response of bystander cells co-cultured with cells irradiated with gamma-rays. Cytometry A 2003;56:71-80. Iyer R, Lehnert BE, Svensson R. Factors underlying the cell growth-related bystander responses to alpha particles. Cancer Res 2000;60:1290-8. Nagar S, Smith LE, Morgan WF. Characterization of a novel epigenetic effect of ionizing radiation: The death-inducing effect. Cancer Res 2003;63:324-8. Huang L, Kim PM, Nickoloff JA, Morgan WF. Targeted and nontargeted effects of low-dose ionizing radiation on delayed genomic instability in human cells. Cancer Res 2007;67:1099-104. Groesser T, Cooper B, Rydberg B. Lack of bystander effects from high-LET radiation for early cytogenetic end points. Radiat Res 2008;170:794-802. Sowa MB, Goetz W, Baulch JE, Pyles DN, Dziegielewski J, Yovino S, et al. Lack of evidence for low-LET radiation induced bystander response in normal human fibroblasts and colon carcinoma cells. Int J Radiat Biol 2010;86:102-13. Mothersill C, Stamato TD, Perez ML, Cummins R, Mooney R, Seymour CB. Involvement of energy metabolism in the production of 'bystander effects' by radiation. Br J Cancer 2000;82:1740-6. Hagelstrom RT, Askin KF, Williams AJ, Ramaiah L, Desaintes C, Goodwin EH, et al. DNA-PKcs and ATM influence generation of ionizing radiation-induced bystander signals. Oncogene 2008;27:6761-9. Frankenberg D, Greif KD, Beverung W, Langner F, Giesen U. The role of nonhomologous end joining and homologous recombination in the clonogenic bystander effects of mammalian cells after exposure to counted 10 MeV protons and 4.5 MeV alpha-particles of the PTB microbeam. Radiat Environ Biophys 2008;47:431-8. Murnane JP, Sabatier L. Chromosome rearrangements resulting from telomere dysfunction and their role in cancer. Bioessays 2004;26:1164-74. Lorimore SA, McIlrath JM, Coates PJ, Wright EG. Chromosomal instability in unirradiated hemopoietic cells resulting from a delayed in vivo bystander effect of gamma radiation. Cancer Res 2005;65:5668-73. Watson GE, Lorimore SA, Macdonald DA, Wright EG. Chromosomal instability in unirradiated cells induced in vivo by a bystander effect of ionizing radiation. Cancer Res 2000;60:5608-11. Aghajanyan A, Kuzmina N, Sipyagyna A, Baleva L, Suskov I. Analysis of genomic instability in the offspring of fathers exposed to low doses of ionizing radiation. Environ Mol Mutagen 2011;52:538-46. Morozik PM, Mosse IB, Mel'nov SB, Morozik MS, Seymour KB, Mothersill CE. Genetic effects of bystander factors from the blood sera of people irradiated as the result of the Chernobyl accident. Radiats Biol Radioecol 2011;51:76-80. Morgan WF. Non-targeted and delayed effects of exposure to ionizing radiation: II. 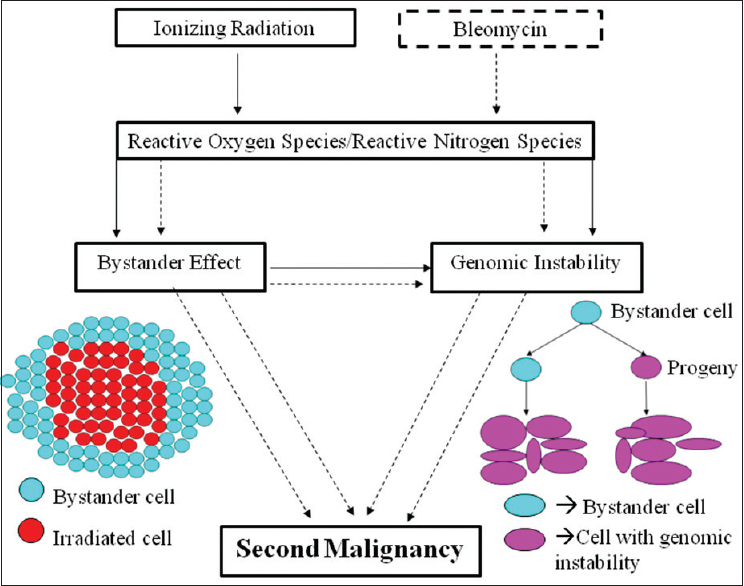 Radiation-induced genomic instability and bystander effects in vivo, clastogenic factors and transgenerational effects. Radiat Res 2003;159:581-96. Terzaghi M, Little JB. X-radiation-induced transformation in a C3H mouse embryo-derived cell line. Cancer Res 1976;36:1367-74.
de Toledo SM, Asaad N, Venkatachalam P, Li L, Howell RW, Spitz DR, et al. Adaptive responses to low-dose/low-dose-rate gamma rays in normal human fibroblasts: The role of growth architecture and oxidative metabolism. Radiat Res 2006;166:849-57. Little JB, Nagasawa H, Pfenning T, Vetrovs H. Radiation-induced genomic instability: Delayed mutagenic and cytogenetic effects of X rays and alpha particles. Radiat Res 1997;148:299-307. Limoli CL, Kaplan MI, Phillips JW, Adair GM, Morgan WF. Differential induction of chromosomal instability by DNA strand-breaking agents. Cancer Res 1997;57:4048-56. Chinnadurai M, Paul SF, Venkatachalam P. The effect of growth architecture on the induction and decay of bleomycin and X-ray-induced bystander response and genomic instability in lung adenocarcinoma cells and blood lymphocytes. Int J Radiat Biol 2013;89:69-78. Azzam EI, de Toledo SM, Little JB. Oxidative metabolism, gap junctions and the ionizing radiation-induced bystander effect. Oncogene 2003;22:7050-7. Hu B, Wu L, Han W, Zhang L, Chen S, Xu A, et al. The time and spatial effects of bystander response in mammalian cells induced by low dose radiation. Carcinogenesis 2006;27:245-51. Hei TK. Cyclooxygenase-2 as a signaling molecule in radiation-induced bystander effect. Mol Carcinog 2006;45:455-60. Zhou H, Ivanov VN, Lien YC, Davidson M, Hei TK. Mitochondrial function and nuclear factor-κB–mediated signaling in radiation-induced bystander effects. Cancer Res 2008;68:2233-40. Zhou H, Ivanov VN, Gillespie J, Geard CR, Amundson SA, Brenner DJ, et al. Mechanism of radiation-induced bystander effect: Role of the cyclooxygenase-2 signaling pathway. Proc Natl Acad Sci U S A 2005;102:14641-6.